Stephen’s Taekwondo Dojang , an associate member of Taekwondo International Dojang , held its Taekwondo “ Poom” Grading Examinations today at Jubilee Higher Secondary School Hall for its registered practicing members. Forty Students hailing mostly .40 Student from St Joseph’s Convent , St Augustine School , SUMI , DGH , Vrindawan School,Girls High School , Sapta Shri Gyan Pith and Kumdini Homes successfully tested for their coloured belt promotions in the encouraging presence of their attending parents and excited families . The event was stage by the founder and owner of Stephen’s Taekwondo Dojang. Master Stephen Rai , a 2nd Dan Black belt and licensed instructor from the British Taekwondo Council. 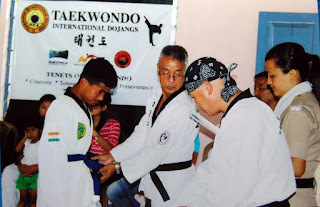 The examination was coordinated by Mr Pawan Chhetri (1st Dan Black belt). The Grading Examination was conducted by Senior Taekwondo instructor Roman Pradhan and Rabin Rai. The Taekwondo Examining Board comprised of Kalimpong Foremost Taekwondo Master, Master Pasang Foning(4th Dan Black belt ) , International Master Instructor Manoz Yonzone(6th Dan Black belt/ Director of Taekwondo International Dojangs) and Master Sherap Lepcha(2nd Dan Black belt). Notably among the examinees Mrs Indu Rai a former Taekwondo Green Belt who again picked up her Taekwondo training after attaining mother hood and after a gap of 15 years. She was tested for her blue belt rank alongside her teen daughter who also tested for her blue belt. This may be called a essence an uplifting exemplary living display and testimonial of the Indomitable Spirit of Taekwondo.